Tickets are available from the Ladies Committee or on the door. 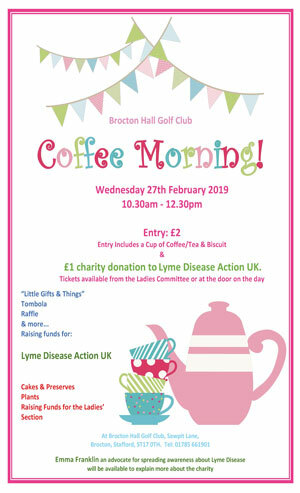 The ticket price of £2 includes a cup of coffee/tea & biscuit and a £1 charity donation to Lyme Disease Action UK. Please check out out Blonde Voyage http://blondevoyage.org and Lyme Disease Action UK https://www.lymediseaseaction.org.uk/ for more information.